Home Featured Politics BREAKING NEWS: Oby Ezekwesili Resigns From ACPN, Says The Party Was Fixated On Using Her To Make Money. BREAKING NEWS: Oby Ezekwesili Resigns From ACPN, Says The Party Was Fixated On Using Her To Make Money. Former Vice President of the World Bank and Former Presidential Candidate of the Allied Congress Party of Nigeria, ACPN, Dr. Oby Ezekwesili has formerly resigned her membership of the party, stating that the party was bent on using her and her personality to make money for both the individual owners of the party and the party itself. The Former Minister of Education also returned all the properties of the party in her possession, including the party’s membership card. At a World Press Conference she called to discuss her reasons for stepping down as Presidential candidate of the ACPN, the accusations leveled against her by the party and other issues, Ezekwesili made revelations of how the owners of ACPN hatched the plan to use her person, even before they approached her to be the party’s candidate, to leverage on her international and local appeal to amass wealth for themselves, but not knowing who she is and the stuff she is made of, had to leave the party for them, so they don’t destroy the reputation and name that took her years to build. They were after the money and not the votes during election time and I, and Nigerians who know me won’t be party to that, so, I stepped down for them, Oby says. 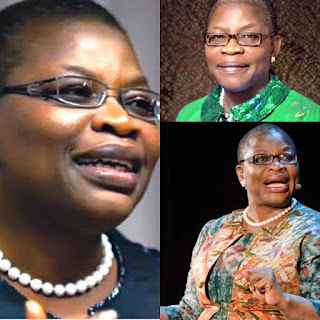 Dr. Ezekwesili made headlines a few weeks ago when she shockingly announced her withdrawal from the Presidential Race, after giving it her best shot, and her now former party, ACPN fired back by dissociating itself from her and declaring support for the Presidential Candidate of the All Progressives Congress, APC, Muhammadu Buhari immediately she stepped down, giving Nigerians the full picture of what was going on before she decided to pull the rug from under they feet. Congratulations Ma’am and like I would always say, YOUR KIND IS RARE.